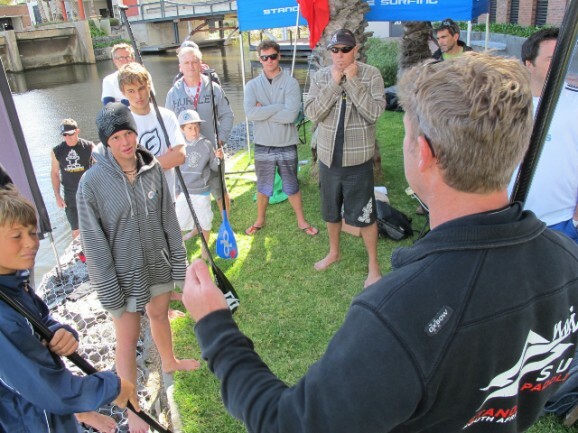 Boss Man’s note: Here’s a recap of the SUP racing action that happened today in South Africa. SA might be a little off the map when you think of SUP racing, but they’ve actually established a very competitive racing scene and have some strong paddling talent (Team South Africa scooped third at the inaugural ISA World Champs back in February). 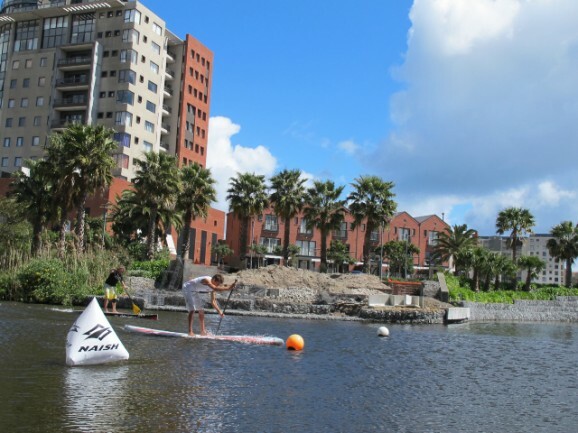 Today the country hosted its first ever 200m SUP sprint event. 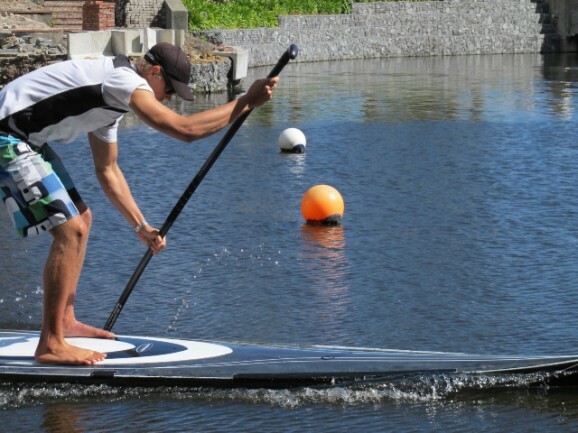 It’ll be interesting to see if the 200m flat water sprint format ever takes off; it’s already an Olympic discipline for both C1 and K1, and stand up paddling has flirted with the format at big events such as the Silver Blade Regatta. Thanks to Peter Petersen for the article and pics. Peter runs SUP Culture & Watersports Warehouse and is one of the leading figures in South African stand up paddle racing. The first ever 200m SUP sprint event in South Africa took place on the 22nd September 2012, in the canals of Century City, Cape Town. Century City Canoe Club had very kindly placed two buoys, exactly 200m apart, down the main straight of Grand Canal, where it is relatively protected from the wind. The wind did pick up during the day, and the paddlers had a stiff 15knot swirling headwind on the last 30-40 metres of the course. The event was held as a Man on Man format leading up to a final. Every paddler’s best time, from any heat, counted toward the Best Time ranking, so there was plenty of incentive to give it gas in every heat. 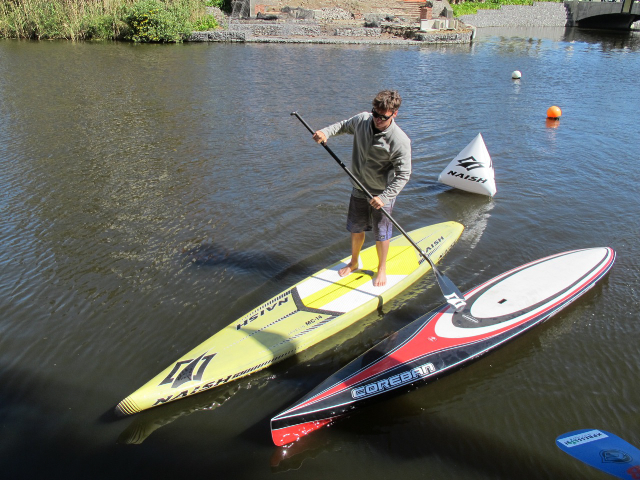 Everyone paddled really hard and it was amazing to see how the times remained relatively stable with a variation of maybe 3-8 seconds from best to worst time – this despite several paddlers swapping boards between heats. 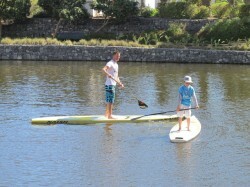 For this reason we have not listed what boards the guys were using, as we simply lost track. Colin Heckroodt was the form man and he was extremely consistent with his best coming in at 1:05 (which is a new unofficial South African 200m Sprint record) and his worst was just 1:08, despite using 3 different boards!!!! Dylan Frick was also quick, pipping Justin Bing for a place in the final against Colin. Andrew Cillie was looking strong all day and he also beat Justin in the losers final to take 3rd in the overall ranking, despite Justin having set a best time of 1:07 in a earlier heat – 4 secs quicker than Andrew’s best time. So Justin clearly ran out of gas in the final heats! 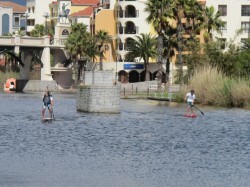 Only one lady took part, Miska Steyn, and she managed best time of 1:19 and a joint 5th – so very well done! Our youngest competitor, Cameron Tripney, is only 8 years old and he is not far behind with a best time of 1:36 and an ave speed of 7.5km/h– imagine what he will do when he turns 9? After all the heats had been completed we had a couple of personal scores to settle and Oscar Wollheim showed what he was made of when he shaved 10secs of his previous best time to beat Guy Bubb. Last heat of the day was a handicap race between our winner Colin Heckroodt and young Cameron Tripney – their best times of 1:05 and 1:36 gave a 21sec difference which was the headstart Cameron was given – it was very close, and would have been even closer if Cameron had kept his head down instead of checking how far behind Colin was…in the end Colin won this heat as well and the event came to a close.